BEING A PARENT MEANS YOULL OCCASIONALLY GET FUN LITTLE NOTE - ProudMummy.com the Web's Community for Mums. BEING A PARENT MEANS YOU'LL OCCASIONALLY GET FUN LITTLE NOTES LIKE THIS FROM YOUR KID'S TEACHER. 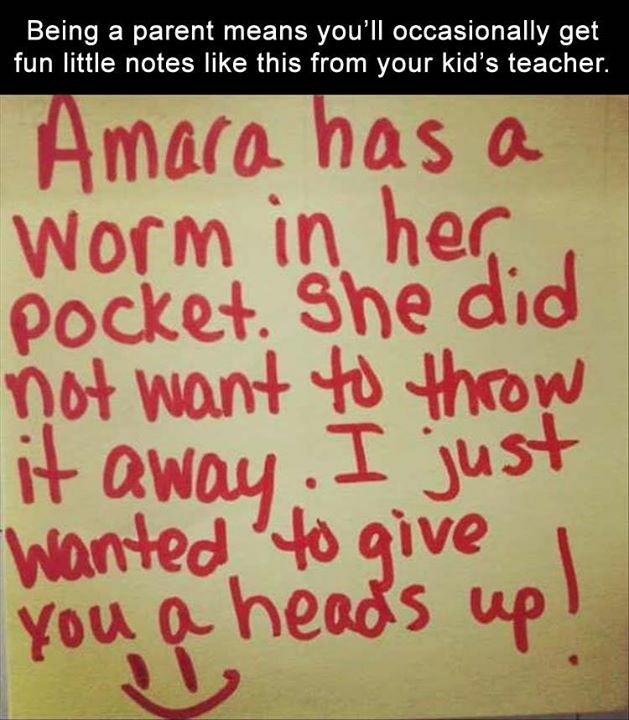 AMARA HAS A WORM IN HER POCKET. SHE DID NOT WANT TO THROW IT AWAY. I JUST WANTED TO GIVE YOU A HEADS UP!